Beverage refrigerators are fantastic appliances that allow you to keep a variety of drinks chilled and ready whenever you need them. 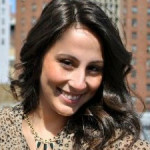 Like any popular appliance, we’ve heard just about every question you can think of. To make it easier for you to find the best beverage cooler for you and your family, we’ve compiled a list of the most frequently asked questions we’ve received. What is the difference between a regular refrigerator and beverage refrigerator? What is the difference between freestanding and built-in? Can I build a freestanding unit into a cabinet? How cold do beverage refrigerators get? How do you clean/maintain a beverage refrigerator? Where can I put a beverage refrigerator? If you have a question that you don’t see listed here, please leave us a comment below or give us a call at 1.800.297.6076. 1. What is the difference between a regular refrigerator and beverage refrigerator? A beverage refrigerator, also known as a beverage cooler or beverage center, is smaller than a traditional refrigerator. Because of the smaller size, the unit uses less energy which can save you money on your electrical bill. It is usually designed explicitly for holding cans and bottles. 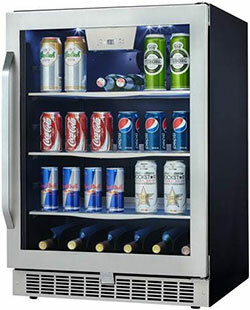 Beverage refrigerators are more stylized, often including stainless steel details and a glass door to display drinks. 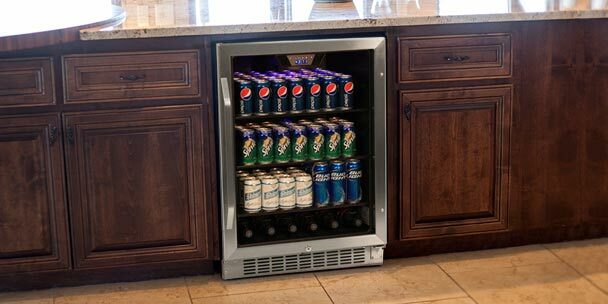 Unlike regular refrigerators, most beverage coolers have adjustable chrome metal shelves or glass shelves with holes for improved circulation of cold air. 2. What is the difference between freestanding and built-in? A freestanding unit is meant to stand alone, while a built-in unit, also referred to as an undercounter unit, is designed to be built directly into cabinetry. Freestanding models need 2-3 inches of space on the top and sides and 3-5 inches of space behind the unit to allow the heat from the compressor to dissipate without overheating the unit. A refrigerator becomes cold by displacing the heat from the inside of the unit to the environment outside of the refrigerator. If there is not enough space surrounding a freestanding unit the heat that is trying to dissipate will be trapped around the unit and will make the compressor have to work harder to keep the unit cool. This could shorten the lifespan of the compressor and therefore your refrigerator if proper space is not allotted. Built-in models have a vent in the front of the unit that exhausts the hot air out and away from the unit so they don’t require the amount of spacing around them like their freestanding counterparts. 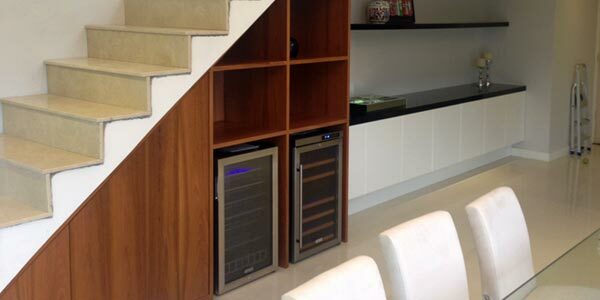 This vent allows these units to be built in flush with cabinetry for a seamless and sleek look in any kitchen or bar. Due to their more costly design, built-in beverage refrigerators will typically be more expensive than a freestanding model. It’s important to keep in mind the desired location of your beverage refrigerator to ensure you purchase the correct type of unit. 3. Can I build a freestanding unit into a cabinet? No, it is not recommended to build a freestanding unit into cabinetry. Since freestanding units require 2-3 inches on the top and sides and 3-5 inches of space on the back of the unit to dissipate heat, building them into cabinetry would eventually cause them to overheat and shorten their lifespan. 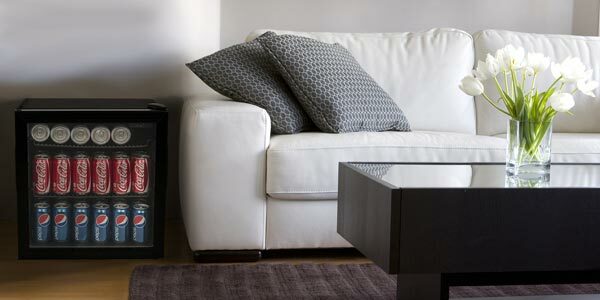 It is ok, however, for a built-in unit to be used as a freestanding unit as most come with finished sides. 4. How cold do beverage refrigerators get? Most beverage refrigerator cool between the high 30’s to the low 50’s. 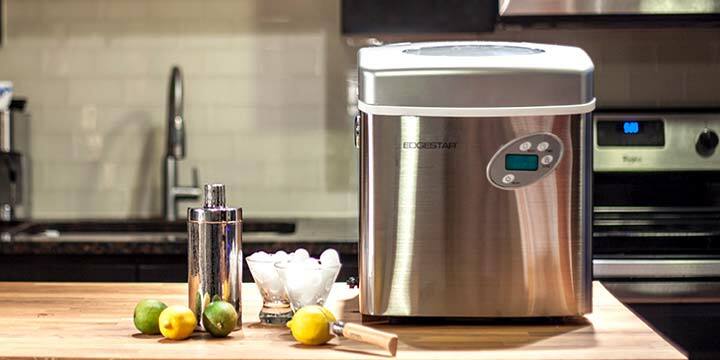 A few can cool down to the low 30’s like the EdgeStar 103 Can and 5 Bottle Ultra Low Temperature Beverage Cooler. 5. How do you clean/maintain a beverage refrigerator? Beverage refrigerators will be either manual defrost or auto defrost. Auto defrost models heat the internal coils on a regular basis to melt away any frost or ice buildup. While this feature is convenient, it uses more energy because heat is being introduced into a cool space. Manual defrost models must be unplugged in order for build up to melt. The unit should be emptied during this process and it is recommended that you move it outside while defrosting to prevent water damage. It is also recommended that you dust any exposed coils on the back of the unit every 6 months to keep your unit running efficiently. 6. Where can I put a beverage refrigerator? One of the benefits of having a beverage refrigerator is the flexibility. 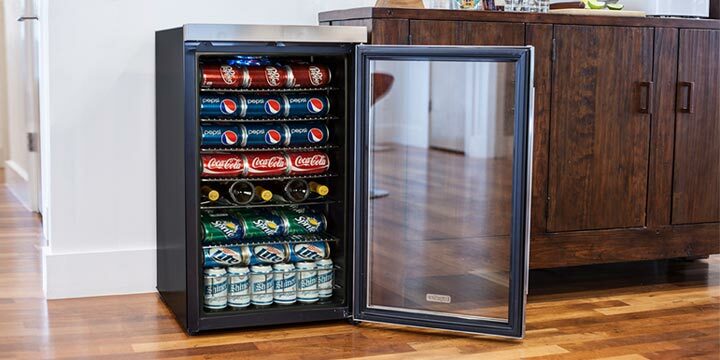 The units are smaller than traditional refrigerators making them perfect for offices, game rooms, family rooms, home theaters, outside patios, home bars and many more places. 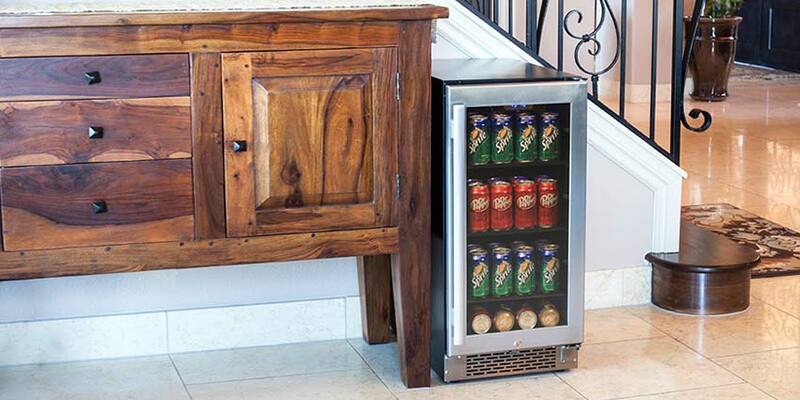 Built-in or undercounter beverage refrigerators can even be built into the cabinetry of your kitchen or home bar. The noise level is similar to a full size refrigerator. The compressor can emit a humming noise, but should not be disruptive to the surrounding areas. can the fridge be adjusted to accomadate beer bottles, ie BudLite bottles? Can Bud lite Beer bottles & All Brand Beer Bottles be store in these refrigerators and how many and what specific boxes do you recommend ? I am looking for a refrig. to hold a pony of beer or a quarter barrel. The bottle beer seems the taste is up to how the bottle gets cleaned or not. I worked at Pabst and the beer for the workers was always top shelf. Do not buy the magic chef dial zone beverage cooler. It’s a piece of junk. I’ve had it operating for less than 7 months and it won’t cool to less than 48 degrees. Do not buy! How often does it have to be defrosted. The one we have is ridiculously loud. Rarely ever stops gurgling. Sickening and it is not a soft gurgle. Picked it up at a big box store and they plugged in another that did the same thing. WHY? My beverage center will not keep drinks any lower than around 45 deg. I had it in my garage so I moved it inside and it still will not cool. Is there anything you can do to make them cool better? Can i place a beverage refrig. under a built-in oven in a tall cabinet?